When I was in eighth grade my burning desire to do whatever I could to make myself stand out the least appearance wise from my peers was at its peak. So whenever I went to the hair salon I opted for long layers and long side bangs. As was always the case, my mom came with me and sat in the chair next to mine. To put this story into context it was 2008 and America's Next Top Model was still very relevant in pop culture. Tyra had settled on sporting long-ish straight hair with a soft fringe and somehow my mom had not only become aware of this, but also thought that this style would look good on me. Because my awful relationship with confrontation had already started to rear its head, I let the bangs happen. I did what most people, or just me, would do after a bad (context, guys) haircut which was the following: look in the mirror to allow what just happened to sink in and proceed to watch the first tear make its way down your face. I was now a bangs person but the worst kind of bangs person: a reluctant one. I clipped them back everyday until middle school was over and the bangs had finally grown out. I'm honestly not sure why I wasted so many words on that story but I'd like to point out that when bangs are done right they're awesome. They frame your face. They can be feminine and edgy. I've eased into my bangs over the last year or so and think that they make having heavy pin straight hair a lot easier to embrace. When I don't want to spend time on the non-bang part of my hair I don't have to and it looks fine (!). 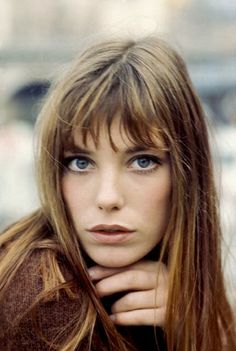 Yes, a big part of the motivation behind my bangs is me wanting to look like Jane Birkin, Alexa Chung, Caroline de Maigret, Dakota Johnson, and Jeanne Damas. Imitation is the greatest form of flattery and how else am I going to pretend like my daily activities consist of rolling out of bed, drinking a cafe au lait while reading Simone de Beauvoir, and smoking cigarettes without the impairing anxiety of their health defects? Considering I make decisions based on the weather that I want instead of the actual weather, I'll have to strategically combat all of the sweat that's going to accumulate on my forehead until the 90 degree heat and 90% humidity subside. My arsenal includes lots of tissues, oil absorbing sheets, and dry shampoo paste. Challenge accepted.